At the moment, the camera industry is changing daily and everyone is upping their game to make their camera more desirable than the other. 4K, RAW, DSLR, Action Camera, 60p and all of that fun goodness that makes us that use them excited and poor. When the BlackMagic Pocket Cinema Camera was announced, I began to drool since it is was something that independent filmmakers were looking for and the extremely small form factor was something that us at MotoGeo were looking for as we just don't have a big truck that follows us around to carry our gear. I was elated when I knew the camera was coming our way and began thinking of some of the features that would benefit what we were going to use it for. 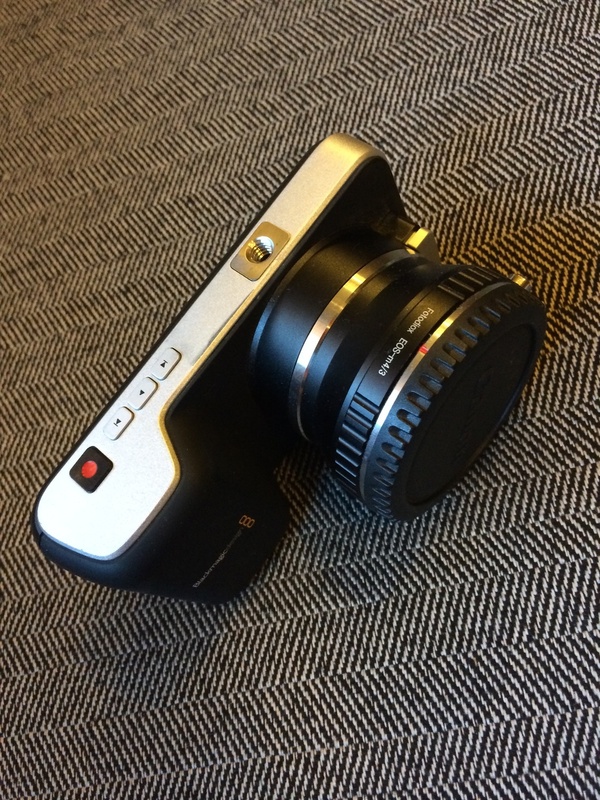 After opening the box, I could not believe the incredible small form factor, yet the sturdiness and solid feel to the construction of the camera. It felt like something that was well built, solid and what you would expect from a manufacturer like Apple. The controls and ports were very minimalistic on the body of the camera and overall had the feeling of a solid point and shoot even though there was so much more to be had from the sensor. As we were going to be shooting all day, I made sure that I had both amble battery power as well as a dedicated power supply when the camera was going to be on sticks. instantly, I was very pleased in the logging that was available in camera as we had a product shoot for 27 different pieces and everything needed to be organized to make editing much easier. The focus peaking made it extremely easy to work with setting focus on the Zeiss Contax lenses we were using with the CY/MFT adapter. The expected flat image was great at holding the detail that we needed and I was beginning to be impressed with this small camera. As I was loving the power this small camera had, we started running into some issues with operation. As we were shooting, it seemed that the camera body was getting very hot despite the air conditioned room. I knew that the camera used the body as a heatsink so I was not too concerned about this heat until the camera began to not stop the timecode during recording after I had pressed the button to stop recording and the only way to stop it was to remove the battery and unplug the camera. This caused some issues as we had to review any clip that this happened on which stopped everyone. This problem continued until finally the camera did just stop working for a few minutes and did not reboot until it cooled down. I was able to prevent this for happening as much when I relied on just the battery or just the power supply without the battery in the camera. Unfortunately, it made it very difficult to work in this condition. In conculusion, the Blackmagick Pocket Cinema Camera produced an incredible image, however for a fast paced filming, or event shooting, the camera buttons were notfast enough to get the camera ready in time. The Heating problems were later figured out to be a hardware error, but it lost some of my confidence in the camera itself. I am sure its bigger brothers handle this issue much better.